The Sony F55 CineAlta camera shoots spectacular images with its 8.9 megapixels (effective) Sony 4K image sensor. You get superb dynamic range, the widest colour gamut, and pristine image quality, whether you shoot in HD, 2K, QFHD or 4K. The Sony F55 is exceptionally small, light and modular, letting you build up the right configuration for each job ‐ or each shot. The camera includes cache recording functions and has an easy-to-access customised user menu that sits on top of the setup menu. As well as the choice of formats and internal and external recording options, you can attach a variety of viewfinders, including the revolutionary optional DVF-EL100 OLED viewfinder, PL-mount, FZ-mount and stills lenses, including second-generation Sony PL-mount lenses, and extra long-life Olivine ‐ Lithium Iron Phosphate ‐ batteries. The chassis is only slightly wider than a typical PL-mount prime lens, perfect for 3D rigs. An optional shoulder rig (CBK-55BK) provides best ergonomics, flexibility and usability for shoulder operation. Sony’s next generation of CineAlta products provides enhanced features for production professionals now shooting in 4K RAW with large sensor cameras; handling large files can be done easily while maintaining the highest levels of image quality. The new products include an upcoming RAW recorder, the AXS-R7 for the Sony F55 and Sony F5 and higher-speed AXS memory cards. These are complemented by the newest firmware (Version 8) for the F55 and F5, continuing Sony’s development and support of the CineAlta platform by adding new features and capabilities directly based on user feedback. Compared to previous Sony 4K recorders, the new recorder doubles 4K RAW recording from 60 FPS up to 120 FPS from the Sony F55 camera. 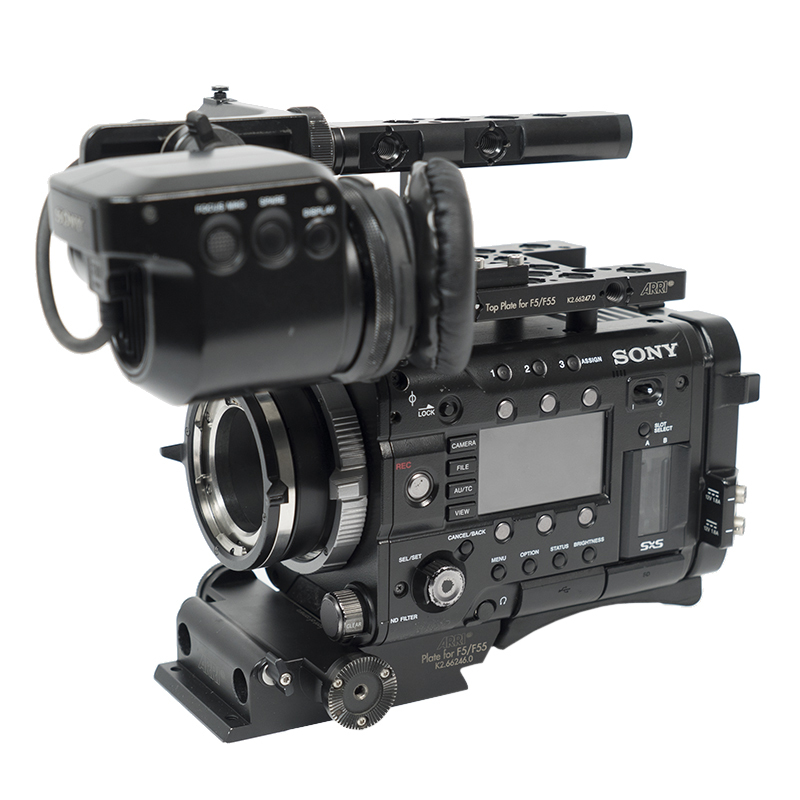 For shooting at higher frame rates, the recorder captures 2K RAW at up to 240 FPS from the Sony F55 and Sony F5, for playback with 10x super slow motion. The new recorder is designed for rugged field performance. A metal filter separates and seals the recorder’s ventilation shaft from the electronics to prevent the entry of dust and water. The recorder’s camera connections are more secure, with a large top bracket that accepts four widely spaced 1/4-inch screws. The additions to the CineAlta line also include new high-performance versions of Sony’s AXS memory cards (1TB and 512 GB capacities) with sustained read and write speeds of 4.8 Gbps, and 44 minutes at 59.94p or 22 minutes at 120 FPS. The dual-slot recorder also accepts current A-series of AXS media, but the new cards are designed to support the write speeds required for 4K RAW 120 FPS recording for those who require that level of performance. The latest firmware update (Version 8) for the Sony F55 and Sony F5, upgrade license installed, enables support for XAVC 4K Class 480 recording at 23.98p, 24p, 25p and 29.97p. Leading third-party vendors already support XAVC 4K Class 480, for those creative professional requiring a higher data rate version of XAVC.